If you're looking to make pasta from scratch but you don't have a pasta machine or even a stand mixer, I've got a recipe for you! Gnocchi is a type of pasta normally made with potatoes but thanks to my friend Allie, she shared with me a recent recipe for gnocchi from Gourmet.com. This gnocchi recipe highlights ricotta cheese as a major component and even better is that the gnocchi is much lighter than the traditional potato version. From the original recipe, I only adapted the flour by using whole wheat flour instead of all purpose. Stir together ricotta, eggs, 1 cup cheese, nutmeg, and 1/4 teaspoon each of salt and pepper. Add flour, stirring to form a soft, wet dough. Shape dough on a well-floured surface with lightly floured hands into 2 (1-inch-thick) ropes. Cut crosswise into 1-inch pieces with a lightly floured knife. Run each piece over the back side tines of a fork to create grooves. Put in 1 layer on a lightly floured parchment-lined baking sheet. To serve this gnocchi, I tossed it with a light marinara sauce and garnished with fresh basil. 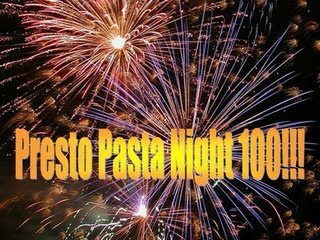 I'm also submitting this to the special Presto Pasta Night 100! hosted by Ruth of Once Upon a Feast. Be sure to check out the round up at the end of the week! Looks delicious! I'll definitely try these! Wow - looks SO GOOD! This looks so good! I love this twist on gnocchi! This recipe looks delicious! I like how it seems easy enough for me to do!! Great dish, thanks for sharing with Presto Pasta Nights. So yummy! Not to mention some whole grain goodness :). I adore gnocchi! Thanks for the great idea to make wholewheat. I'll have to give this a go sometime!